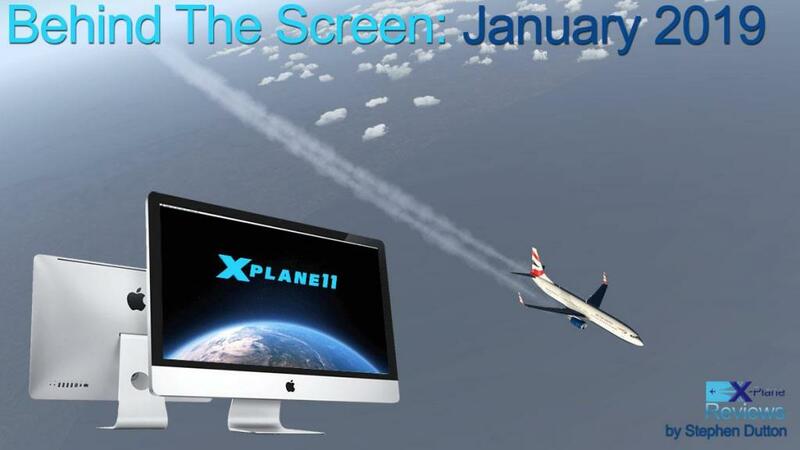 Welcome to the New Year and a new version of X-Plane in version 11.30 going final. The release didn't make Christmas 2018 (the original Laminar roadmap goal) but it was quickly through the Release Candidates once they restarted in 2019, sometimes it is great just to give up. That is the one thing I find really weird... a lot of developers try to make the Christmas deadline and then put out the product, and it is either in aircraft, scenery or mostly plugins and then just close it all down until the next year.. so most then say to the huge amount of bug comments "I'll look at it in the New Year", which is really dumb, in that you have this really very nice and shiny new X-Plane application, but you can't actually use it because it is usually very buggy to use and has to be sidelined anyway... for now the developer is away on his Hol's or Vacy and wishing the family well with a nice big turkey, meanwhile you are stuck with the other style of a Turkey... a none working application... so why not just wait until the New Year to release correctly and then be available to update the fixes to a wanting audience, at least Laminar had the good sense to do this. As sometimes a very nice early Christmas present, can just turn into a burnt out dud bird. It was an odd Christmas and New Year break... in the past X-Plane for the holiday break went to ground and was very quiet, but this year it was the opposite of that with the chattering classes telling us all about their coming wares or projects and announcing this or announcing that... but first we all still have to get over the 11.30 final mountain. And a big one it will be. Having their fingers burnt with the extended 11.00 release from the constant changes and the to and throwing from Laminar, the developers this time around are being doubly cautious and who can blame them. Plus there is the added learning curve of several new built in applications now inserted into the simulator... it was very surprising how long it took the devs to get their heads around the FMOD sound application, even months later they where still being trickled out if still very slowly. The Particle engine application is very similar to the FMOD application, but there are far, far more elements to consider, but it is a very impressive piece of kit, and something that drags you back to the older Adobe After Effects days, I am hoping it will be extendable as well for more effects and ideas in the future, as this is really a big hidden application that is build right into the simulator. And that is the huge advantage that X-Plane has over any other simulator, and very much in the old style of Apple's approach to computing, give them the brilliant applications to turn out outstanding brilliant work... but hey services today for Apple make more money than creativity... thankfully in X-Plane it is still the other way around. But now here comes the tsunami and the huge wall of 11.30 updates that will overwhelm you and swamp you to death, with update after update filling out your days (and nights)... and that is from just one or two developers. Certainly the new updaters with X-Updater and SkunkCrafts are helping out, and personally I prefer the Java version, but the lastest Shunkcraft's v2.2 is far better, in now not making you wait for long periods just to start up the simulator, I really never liked applications that took over your computer and worked away in the background installing items you don't know what are being installed. A small note in don't update to be new Java update SE 11.0.2 as it kills all the FlightFactor plugins, reload in the previous version to keep the plugin working... I found that one out the hard way. It just shows how much bigger X-Plane is now, the volume of updates on already released aircraft and scenery, but the release list for the next few months is simply huge, again with most waiting for 11.30 to go final. Even Carenado have noted that every aircraft that they released for X-Plane10, even updated to use for X-Plane11, then won't however get the full XP11 treatment, and so a few will now be left behind and that is really sad if one of your personal favorites is on that list, as most of the XP11 conversions from Carenado are exemplary. But maybe some really do needed retiring, as their design is ethics now getting a little if dated... or feeling very out of date to the newer more dynamic feel of the simulator. Overall X-Plane 11.30 is a huge jump forward, but as I noted in the overview review, then there is a lot buried deep in the code in there as well, and you don't see it or feel it yet, but it will transform the simulator to a far more efficient and better application. Currently you are like going forwards and backwards at the same time and simply ending up in the same place as you were in X-Plane11.28. Let me explain. You certainly have already received some nice Vulkan/Metal efficiencies, but they have been countered with the negative aspects of even more features and tools, overall you came out slightly ahead, with say between a 5 to 10 framerate gain, but mostly you have not seen that huge "oh wow" speed and framerate space factor. Don't despair however as for that aspect it will come later, but also don't expect your early Win7 era computer to suddenly act like a Win10, as the Vulcan/metal still needs those modern processors to do the higher efficiency scaling. Laminar have noted the basic Vulkan/Metal code is now actually completed, it just refining it and testing to get the best results from the new code. I even finally gave in and went and posted a note on the forums in the fact of the really annoying comments of the "Really Bad Framerate" with every update or version that Laminar released... I will say that yes the simulator can be overwhelmingly complex sometimes, with one thing here affecting something else over there, but right through the whole beta process my framerate was actually pretty steady, unless Laminar made a muddle, which was about twice, again I will stress it is sometimes extremely hard to keep everything running in alignment with one or another area of X-Plane going bonkers to keep it running all smoothly. But what did get seriously annoying was the fact that these idiots didn't even do the basics of updating 101... clean out your preferences is absolutely no.1 on the list. If you have older beta preferences and you add in an update then those old preferences will then go and merge with the new settings and in then creating a hybrid setting that you are trying to run and gauge the new updates though... in other words you are going to get a really mixed up running a simulator of crap code and yes the results are really bad framerate. You just have to redo the basics of the preferences and clean out the layouts, then even an X-Plane rebuild is also required to find the basics of X-Plane when the update goes final to clean out all that old waste, simple steps but a requirement when wanting efficiency, and house keeping is yes a chore, but an essential chore to keep everything very clean with no clutter within the system. Those comments just make everything totally worse, and it reflects on those users naivety on how they use the simulator with a sort of the blind leading the blind... and yes they are extremely distracting and annoying in their own total incompetence. Housekeeping is yes and a huge chore, and this year I went at it with gutso over the break. For once that backup of a backup went in the bin, I needed space on my drives as now with the 1gb to mostly 2gb average download files now it is amazing how quickly the available space is gobbled up, some sceneries are now averaging 6gb and the 14gb of TNCM - Princess of the Caribbean is nothing to the new mega loads of Orbix's UK FTX 100gb... even with my updated SSD drive I only still have 600gb of working space, so how long is that going to last, and no I will not ever go back to a platter drive as my erratic history with them are... well history. But a full on two day housekeeping trial shows how much work you have to do now to keep the simulator in top condition, and I could have easily spent another full day doing more. The new Stairport SAM plugin is already making it's huge presence felt in X-Plane, The updated Zurich was simply great, but it is the master's Misterx6 in ShortFinal's monster EDDM - Munich that really shows off on how brilliant the plugin is. This scenery was so complex and so huge it devoured a huge chunk of last week, but the feeling is that it is also a showcase of what X-Plane in features now is really delivering when all these different dynamics of the simulator come into play together, and the interaction is now becoming first rate... notable are two other plugins now in final upgrade betas, with xEnviro and WorldTraffic3 both coming soon very close to a computer near you. Both applications have been slow with updates and so both really require now a real step forward, certainly with the case of xEnviro. If you follow these comments on the end of the month rambles you will know I have not been exactly charitable towards the xEnviro developers and that they didn't take up my offer to beta test the new version shows that their feelings are were not exactly reciprocated. But the one area that I find really vexatious with developers is the fact that they don't do quick updates to fix immediate issues before continuing on with their highly profiled roadmap. Yes it looks brilliant to layout all these future exciting breathless roadmap features, but if the current version is complete version of buggy crap, then the developers are doing themselves absolutely no service what so ever... it is called "Ticking off" the very people that you are trying to sell to or to keep as a customer for future products... a year is too long without an update in any product, but with a buggy one that is an eternity... or even a miracle the plugin is well still in there and being used, it is only in the strength of the actual product and with no real replacement that xEnviro is still a major factor in the reviews and my general flying... and yes I have tried them all so don't send me environment combo's of this that will work with that... as I have already been there. I will most possibly still note the same xEnviro mantra again around next month, or even the month after that, but the point is developers need to start to heed the warnings, as we are only trying to protect them from their own devices. But there was some standouts in January that really showed where we are going... one is the Boeing 787-900 from Magnight. The aircraft is not even close to actually being even a beta at this point, but it is fused with genuine ideas and forward momentum that is added in day to day via the updater. I finally got a full flight out of it from Hong Kong to Melbourne and really enjoyed the experience, it will be amazing when finished. This was flight alone was also now available because finally X-Plane has a decent VHHH or Hong Kong via the extensive work of TOD, and the latest version v2.1 also comes with SAM interactivity... Asia in X-Plane, it is a Beautiful thing and finally we are moving around the world again to some decent scenery. WSSS - Changi is also part of TOD's packs, but I found it was not as updated as the VHHH version, but I haven't yet tested or used the updated the newer 1.2.1 Jan 19 version. WT3 work's exceptionally well on both airports and adding into the excitement, and for me there is a feeling around of going back to airports that were a big part of my earlier X-Plane experiences like VHHH, WSSS and the new LMML Malta, all but were abandoned because they all fell behind badly as X-Plane design moved forward, any ex-fsx converted scenery are thankfully now very much buried in the past. And with all this in an updated new X-Plane11 version, with brilliant new clever sceneries and a new clever active element with the SAM plugin.. It was a big month in January, now we move into February and yes it is an exciting but still very demanding period for the simulator... "how many updates? that many?"..... Oh God!